Smart Blok Jr. is the newest member of the Smart Blok family designed specifically for use in your conversion pick-up truck or Suburban. 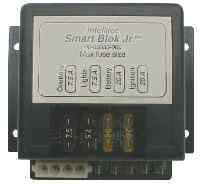 Smart Blok Jr. provides the fusing for the vehicle converter added loads, and time controlled outputs for the lights. This eliminates a main cause of dead batteries in conversion vehicles. Some other battery saving devices treat the symptom of a dead battery, cures Smart Blok Jr.
the cause of the dead battery. Smart Blok Jr. knows when you leave the vehicle and it turns off all of the power to the lights ten minutes later. When you enter the vehicle, Smart Blok Jr.automatically turns the power back on to your lights. This allows the occupant to have power to the lights without having to turn on the ignition. That's not all. Smart Blok Jr senses if the battery voltage is getting too low and turns the lights off in less than two minutes rather than ten. When Smart Blok Jr turns off the power, there is no "hidden" button to press. The next time you enter the vehicle, or turn on the key, it resets automatically. Voltage above 12.1 volts and Ignition Off. Voltage below 12.1 and Ignition Off.